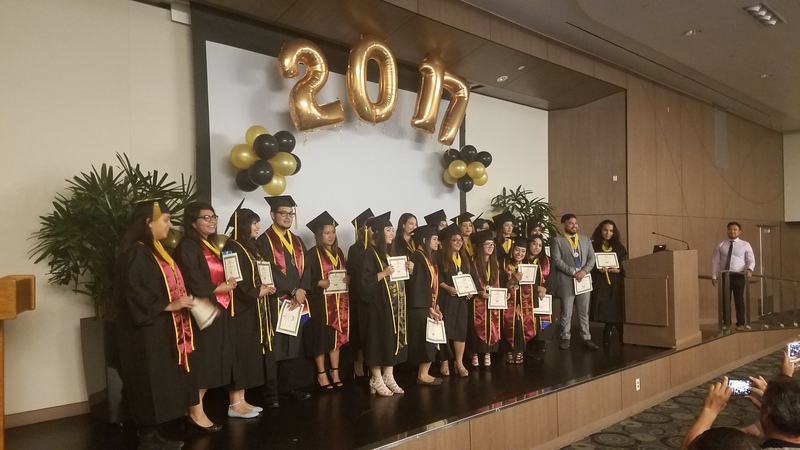 Twenty-two Cal State Dominguez Hills students proudly walked at the special graduation ceremony May 2 for undocumented students – an event planned and hosted by the Toro Dreamers Success Center and the Undocumented Student Ally Coalition. Students from different backgrounds, races, ethnicities and career paths came together with their families, friends and faculty to celebrate their achievements and reflect on the years spent at the university. Some students couldn’t hold back their tears after receiving their medals and giving speeches thanking their families and friends for their love and support. This and similar graduations are made for students to be able to receive their diplomas and medals in a special, intimate setting, personally say a few words and thank everyone who attended and supported them along the way. Later, a guest speaker, Gloria Montiel, came out to say a few inspiring words to the students. This special and memorable celebration is not the only one that Dominguez Hills is holding this year. There is also the Douglass-Bethune Grad Celebration for African American students, the Dolores Huerta Grad Celebration for Spanish-speaking students, the Student Disability Resource Center Graduation, the Veterans Grad Celebration and the Asian and Pacific Islander Grad Celebration. These celebrations are open to graduate and undergraduate students, regardless of ethnicity, as well as friends and family. For more information on upcoming events please visit: csudh.edu/commencement/special-graduation-celebrations.